As the amazing Neil Gaiman says ‘A book is a dream that you hold in your hand’. In English at St Edward’s we have been striving to bring a love of reading and imagination to our students. Students have been writing in their portfolios and journals and developing skills in all areas of English and literacy. Year 7 have been completing a unit on ‘Belonging’ with a focus on Australian Poetry. Learning about what it means to be a St Eddies boy and belong to an EREA school as well as looking at ideas of ‘Belonging’ in terms of our wider community. They have settled into the College and have enjoyed library lessons and lots of new technologies including practicing for upcoming NAPLAN examinations and completing Best Start testing. It has already been quite a full term for them. Year 8 have been learning about various issues and ideas through a play this term in a Unit called ‘Dramatic Form’. They have also completed some practical drama and some classes have had visits with our Year 12 Drama students in the theatre. Some great fun is being had in many classrooms with improvisation and theatre sports. Year 9 have been creating multimodal texts over the past few weeks in a unit on ‘Documentaries of Survival’. This task has developed their ICT skills as well as analytical and reflective tools. Year 10 have studied ‘The Subaltern’ this term with a visual representation and reflection/analysis which develops their skills in both critical thinking and creativity. The boys have been learning about those people on the margins of our society which has strong links to our Social Justice Program and the touchstones of EREA schools. Gazing through the kitchen window, I looked upon the brilliant array of ships which seemed to foam through the oxford blue sea, like a bird swooping upon its prey. The ragged horizon of the sea meets the sky in a beautiful chaos. The sky broke, like an egg into full sunset, with the base of the water catching fire, as I forcefully knotted my apron, ready for the day’s turmoil of home labour. The delicate Epigaea repens, scattered across the land like polka dots, native to the traditional, barren, landscape of Nova Scotia which held ties to that of commercial fishing, for the ragged sea below called upon the fisherman and their families, held together by the millennial long branches of traditional convention. The scent of salt slowly descends upon me, transmogrifying into the form of a rugged, elderly man in large rubber boots, shaggy white hair and stubble sat dryly in whatever position he woke up. His woollen garments, containing the permanent sea stain and sweat, he squeaks over, lightly kissing my forehead as I turn each faucet to prepare the water to wash the previous days fishing wear just like the previous day and the day before that, and the day before that. The boat has and, is and, always will be a very integral part of my family’s history, passed on from generation to generation. Ironically, it is named after my mother who just like the boat, is stagnant in her reality and is desperately trying to keep everything in her surroundings looped in her own time stone. Apart from Jesus, literature is one of the only things that saved me in those days. Books from all over the world, providing an escape from the perpetuated promises past, present and planned, planned for me even before I was born. Reading about other’s realities takes me out of mine and makes living this elongated, good for nothing life, more bearable. Disputing demons daily that forever seem to find me. Constantly fighting my own infinity war but, without a storm breaker or an infinity gauntlet to protect me or change the course of reality with the snap of my finger. Our HSC cohort have been busy completing multimodal assessment tasks and the Craft of Writing. The Year 12 English Extension 1 class have completed their multi-modal presentations interrogating Literary Landscapes. Jake Vidler explored war literature – drawing on the works of Virginia Woolf and Wilfred Owen. Jake also looked to Tim Winton’s recent work on toxic masculinity. Jake digitally manipulated war images to convey his views on the changing landscape of war and masculinity. He further developed these concepts by writing three short studies and transforming these into audio books. Patrick Goard drew on the literary works of Jack Kerouac, Allan Edgar Poe and practitioners of absurdist theatre. Patrick composed three verses of Epic Poetry and then transformed these into a short film. 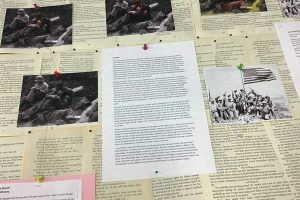 The students were able to identify a specific literary world, challenge existing literary conventions, and creatively represent these values and beliefs in a contemporary setting.